Diode Lasers in Dentistry – Are they Useful? Diode lasers have improved the way we manage periodontal disease and gum disease. Used during a tooth cleaning, the Diode Laser will help inflamed gum tissues heal faster. But this is just one of many used for a diode laser! Shown below is a Diode Laser being used for bacterial reduction during a cleaning. 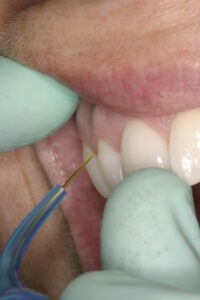 As you are probably aware, diode lasers can be used for a variety of soft tissue procedures including plastic surgery, tumor removal, uncovering teeth for orthodontics, reshaping the tissue around brackets or following orthodontic treatment, uncovering implants, and as an adjunct in our treatment of periodontal disease. Procedures are performed quickly, often without anesthesia, and there is very little post-operative sensitivity. 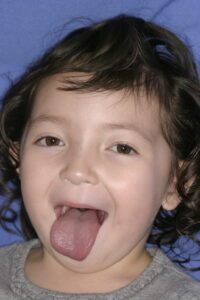 We can even use diode lasers for treatment of lesions like cold sores and aphthous ulcers (canker sores). Diode lasers are safe to use around metal like a dental implant or a crown. Our office uses diode lasers for frenectomies (I can’t imagine going back to the scalpel for these! Se a fun example below) gingival curettage, gingivectomies, laser bacterial reduction, laser assisted periodontal therapy, lesion removal, and treatment of canker sores and cold sores. Cold sores before treatment. Diode lasers speed healing and decrease pain. Cold sore area a couple days after treatment. with a diode laser. If When diode lasers are used on a cold sore during its prodrome or initial tingling phase, the sore may be prevented from appearing. If used during the active phase, the sore will immediately start to heal! So we are trying to have patients call to schedule this low cost procedure as soon as they feel the beginnings of a cold sore. Shown below are a couple frenectomy cases treated in our office with diode lasers. Note the very thick, fibrous frenum or attachment that holds the tip of the tongue to a point very close to the lower front teeth. Imagine being instantly able to stick your tongue out when you haven’t been able to do this for years! This patient is “tongue-tied” with a strong frenum attachment made it so our patient could not lick her lip or stick her tongue out. Easily treated with a diode laser. Immediately after surgery – this procedure was done with topical anesthetic only! We take great pride in our ability to provide dental care as comfortably as possible. It is always nice to hear from you!